Unless you are lucky enough to live in an environment where the weather is always sunny and warm, the winter cold imposes de-motivating energy into pretty much every area of our everyday lives. As much as we may not want to go to work, go to the store, go anywhere, the winter cold makes it even worse. For runners, it makes keeping up with our running routines feel more difficult and intolerable than ever. 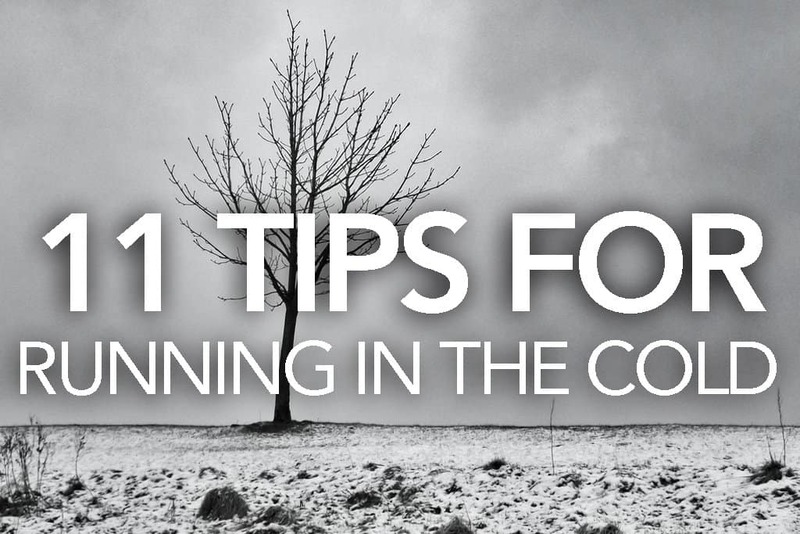 Here are the 11 tips for running in cold weather to help you stay on warm, on track and actually learn to enjoy cold weather running. All of the rest of these tips are meaningless if you lose motivation to run in the first place. Don’t let the cold get you down, stay motivated to run by meeting friends for a “running date,” or signing up for a race that’s in the spring. If you know someone is waiting for you, or that you have to compete as soon as warm weather arrives, you are much less likely to skip workouts while it’s cold out. Another great way to stay motivated is to invest in some new gear. We detail some great gear to stay warm. You’ll probably need to anyway in order to stay warm out there, and nothing makes me more excited to run than a new pair of shoes, a pair of fresh new compression bottoms (we like the ColdPruf brand - very well respected within the running circle), or some new socks like these from Drymax. We put together a very thorough list here of the top 5 running tights for cold weather so some are better than others when it comes to getting you prepared to run. Pant sits at natural waistline. Front and back rise provides an exceptionally comfortable fit and maintains coverage during various activities. Features a "regular fit" meaning it is neither athletic or loose fitting for a comfortable range of motion. 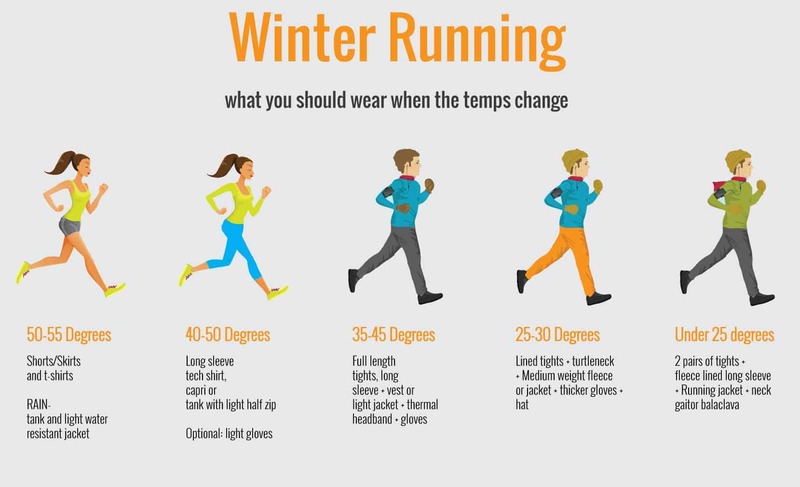 What to wear while running in cold weather? Great question - Knowing how to accurately dress for a run in cold weather is a science. We’ve all been on a run where something we decided to do with our wardrobe didn't go how we wanted. For running in the cold, you want to be warm without sweating so much you get a chill. The rule of thumb is to always dress as if it is 20 degrees warmer. Dress in layers.﻿﻿﻿ Wearing several thin layers of clothing helps trap warm air between each layer, keeping you considerably warmer than if you were to wear one heavy layer. Try to wear layers that have zippers, especially near the neck, so that rather than shed layers, you can just unzip to ventilate as you warm up. Wear the right fabrics. Staying dry is just as important than staying warm. Make sure that your base layer is made of as many moisture wicking materials as possible, especially your socks. The Saucony 6-Pack no show socks are the ones we recommend the most. They are perfect for Men and Women and for temps around 50 degrees. For your head I put together a list of the most durable Balaclavas for runners. Wear a protective shell. If it’s windy, it's critical that you wear some sort of waterproof windbreaker or “shell” to protect you from the wind and precipitation. Gloves and Hats. The temperature at which gloves and a hat become necessary varies between runners. While you’ll always want to include them when it’s around 34℉ or below, some find it comfortable to wear them around 45℉ or below. Experiment with gloves and a hat, and find out which temperature point works best for you. Also remember to take wind chill into account. Even if you feel comfortable going bare hands at 40℉, you might still want to bring a pair of mittens if the wind chill is high. The ﻿Head Digital Sport ru﻿nning gloves﻿ are the highly rated gloves on Amazon. I put together a pretty good list of the best gloves for running in the cold that you can also view for research. Sometimes when I run in the winter with gloves, my hands get really hot and sweaty to the point I have to take off my gloves. Trying to shake gloves off or peel them off of my hands takes my attention away from my pacing and breathing. These are ones that are just thick enough to keep me warm in the beginning of my run not too hot as I warm up. Also, they are easy to remove during my run. Cover exposed skin as much as possible. Your body will lose the majority of its heat through any exposed skin, so cover up as much as possible. You can cover your cheeks, or any other exposed skin with with vaseline to keep them from getting chapped and wind-burnt. Focus on your head, feet, and hands. These are the places heat leaves the body most quickly, and likely the places you will feel the most discomfort from the cold. Wool socks, hats, headbands, and gloves are a must when the temperature dips below freezing. If it’s really below freezing, layer up in these areas. Wear gloves under a pair of mittens, and a headband under a hat, and two pairs of socks. You can also apply plastic wrap over your socks, or slip your feet into a plastic bag before putting them in your shoes, to help keep your feet dry on extra slushy runs. ﻿﻿ Your core body temperature drops as soon as you stop running, and it’s important to get out of damp clothes as quickly as possible, especially those layers closest to your skin that soak up sweat. After you’ve changed, drink something hot. If you are driving to run, keep a thermos of an extra hot beverage in the car that will be just the right temperature when you’re done, or head straight to a coffee shop for a hot drink and change in the bathroom. ﻿﻿As with any run, a good warm-up is important – but it’s essential when preparing for an outdoor winter run. Try warming up indoors, to help you get physically warm and look forward to a cool breeze. Before you get dressed for your run and leave the house, do whatever you can to work up a quick sweat (don’t get sweaty in your workout clothes, though or you’ll just get chilly when you leave). Do some quick house cleaning, run up and down the stairs, or do so some jumping jacks/lunges/squats. If you can get really warm inside the house, a cool run outdoors won’t sound so bad, and your muscles will be loose and ready to work hard. Many runners head indoors and utilize the gym when the weather drops. This is a good, easy solution to avoiding cold temperatures, but the treadmill can get pretty boring if you’re running up to six days a week. A good way to mix it up is to use the outdoor runs for speed workouts, and the indoors for the longer, slower runs. Speed workouts will keep you warmer, and outside for a shorter period of time, than those long runs will, so it’s a good idea to run outdoors when you are doing a more intense workout like speed work, tempo runs, and intervals. However, you will also sweat more when you are doing hard workouts, which could invite a chill when doing them outdoors. Stay close to home, so that if it becomes intolerable or you start getting the chills you can go inside to warm up. If you work outdoors, I’m sure that you already know about those little heat packets that heat up instantly and last for a few hours. These, or a thermal hear pad, can be great tools for runners to use for cold weather running. 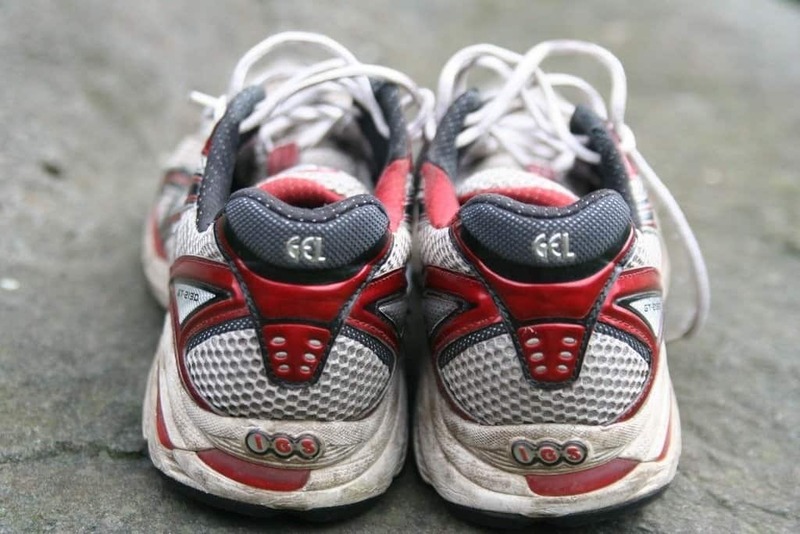 Just unwrap a pack and slip them under the tongue of your running shoes before you lace up or rubber-band them to your hands underneath your mittens. They may not be the most comfortable thing in the world, but after a half mile or so you’ll get used to them, and they are way more comfortable than losing the feeling in your fingers and toes. The Hot Hand Warmer﻿﻿s are the most recognizable in the running world as well as the most recommended by hikers . Pay attention to wind chill. Wind increases the rate at which a body loses heat, so the air on a windy day feels cooler than the temperature indicated by a thermometer. Make sure that you check the wind chill temperature and prepare accordingly. Even if it’s 45℉, if the windchill is really high, you’ll want to add a windbreaker or some running gloves. On really windy days, start your run going against the wind. Halfway through, switch directions and run with the wind at your back. This will help you avoid getting chilled after you have started sweating under your layers. ﻿﻿Remember to apply chapstick before you leave the house, and if you have a secure pocket it’s a good idea to bring it with you. You can also apply vaseline to your lips, nose, cheeks and ears to protect them from the drying effects of wind and cold. Run close to home or bring ﻿your phone or cab fare. ﻿Uber or a cab can pick you. Always be prepared to get indoors if necessary. Running in cold weather poses more threats to runners than warm days, so make sure to bring a cell phone, some cab fare, or run in short loops that are close to home. That way, if you find that the cold becomes intolerant, or you slip on an icy patch and injure yourself, you have a good exit strategy. Do your best to follow these 11 tips to keep you warm and injury free while running in cold weather. Looking For A Training Plan To Help You Hit A Goal? Whether it's a getting into shape, relieving stress, or achieving a goal our FREE Training Plans are perfect for you!